I'll be honest and say that I've always been against the traditional "blue for boys-pink for girls" cliché. I thought, I think, it's too expected and conventional. That of course is my opinion and it can be very subjective. When thinking about our nursery I drifted away from those color combinations and considered, since the beginning, a gender-neutral color palette. Even now that we know baby G is a boy we are keeping the same palettes (still have to decide on one) and we'll make it a boy room with the accessories. But, this nursery proves me wrong. 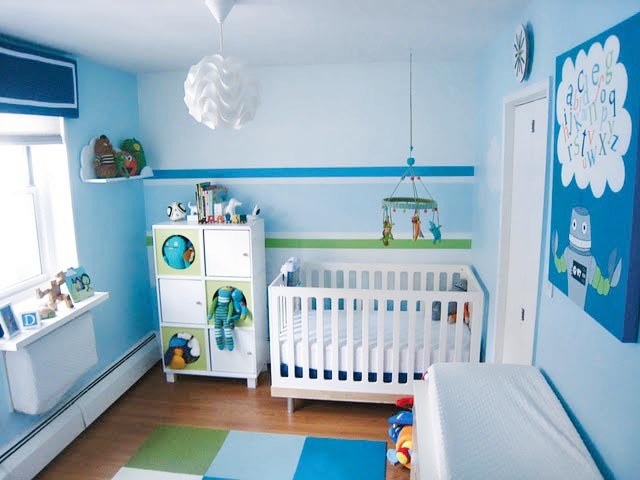 This is an example (to me) of a "traditional-blue-for-boys" nursery done right. 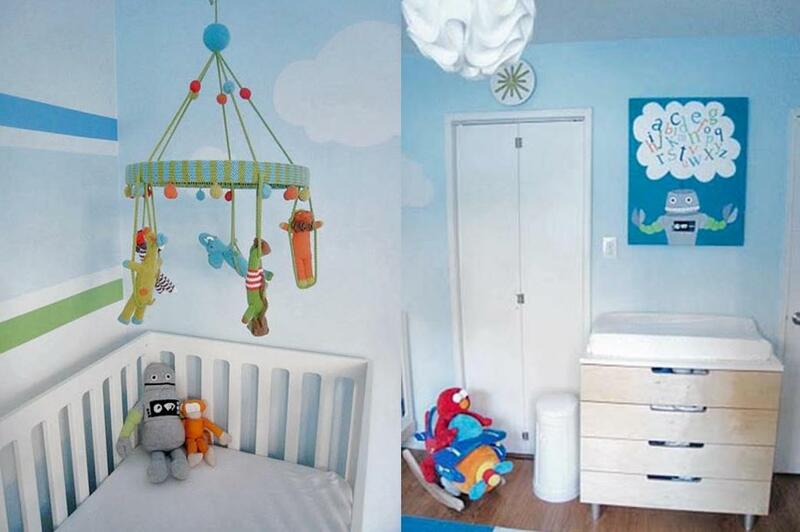 Angeli, from the blog Art by Angeli, designed this great space for her little boy. I like the blue-green palette and the robot theme. Isn't it modern and cool, but still playful? And you want to know something else? There are a lot of DIY details done by Angeli herself. She is an artist and she painted all the art in the room, made the mobile and sewed the robot dolls. Aren't those amazing? Her little munchkin is a lucky boy to live in a such a wonderful space created with much love by his mommy. Please go to Angeli's blog to see more pics and some tutorials. Thank you sooooooooo much for sharing about my baby nursery. I LOVE reading your blog. Keep up the good work!